A game of world exploration and empire building. You represent a European empire colonizing the Mediterranean and shipping to all parts of the world to increase the empire's glory and status in Industry, Culture, Finance and Politics. When a region opens up (i.e. the shipping lanes are full) a player can colonize, attack or retrieve resources from that region. 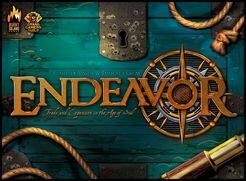 The game plays easily as each turn a player builds a building giving him a special action or increasing one of his main statistics, and gets a number of people with which to activate buildings for special actions (Ship, Occupy, Attack, Draw or Pay). Increased skill in Politics allow the player to hold cards that help increase his statistics and glory.